Kythera was magical as always, and this time I learned a little more about Kythera’s ancient past, particularly her ties to Lacedeamon. In this and the next entry, I will provide the highlights of my findings. The island of Kythera sits off the southwest tip of Cape Malea on the Peloponnese and has been inhibited for millennia. Historical reference to Kythera goes back at least as far as the Iliad, and the archeological evidence suggests a thriving Minoan metropolis existed here about 2000 BC. According to legend, Kytheria was the first place in the Greek world where the goddess Aphrodite was worshiped. Except for brief periods of occupation by the Athenians during the Peloponnesian War, Kythera was an integral part of Lacedaemon for approximately 500 years, from roughly 600 to 100 BC. The first evidence of Lacedaemonian settlement on Kythera was discovered less than 20 years ago, and money for extensive archeological research has not been made available. However, in 2010, archaeologist Aris Tsaravopoulos from Greece’s 26th Ephorate of Classical and Prehistoric Antiquities carried out a limited project with a team of twenty international, amateur volunteers supported by the local community and Bishop Seraphim, Kythera’s Metropoliti. These digs suggest that the role and influence of Sparta on the island was more significant than previously believed. Although only able to (literally) scratch the surface during the one month of work in 2010, Tsaravopoulos is confident of finding additional artifacts and foundations which will undoubtedly enable more comprehensive conclusions if excavations continue. Tsaravopoulos found sponsors and volunteers for at least one more summer project, scheduled for July 2011. Unfortunately, Mr. Tsaravopoulos was not on Kythera during my stay, but I spoke with him by phone and his son was able to show me the site of a city dating from the Lacedaemonian period and answer a number of questions. The classical capital of Kythera was a walled city perched on a steep hill just west and inland from the site of the old Minoan port of Skandeia. It housed about one thousand inhabitants and remained occupied from roughly 600 BC to 100 AD. Although the city would have been predominantly perioikoi in character, Tsaravopoulos believes there was a Spartiate garrison stationed in the city at least during the Peloponnesian war. The city contained an agora and a number of temples and civic buildings. Initial digging, which uncovered only the youngest layer of the ancient city spanning the hundred years before and after the birth of Christ, revealed pottery, tiles, and coins, mostly from the Roman period. However, impressive Doric pillars from a late 7th/early 6th century temple to the Dioskouroi were incorporated into a Byzantine church built on the site in 1290, giving testimony to strong Spartan influence at the time of the city’s founding. Outside the capital city, there are indications of a Laconian watch-tower on a hill north of the capital. The site provides a good view to the north and, when weather conditions permit, to the Straits of Malea and the Peloponnese (Laconia) beyond. Also visible from the city or the watch-tower are two tiny islands, the Dragonara. The larger of these, Megali Dragonara is the site of a temple to Poseidon. A large number of offerings from the 5th century have been found here, and Tsaravopoulos believes that sailors routinely put in to the sanctuary either to entreat or thank Poseidon for safe passage around the dreaded Cape Malea. In addition, a sanctuary dedicated to Asclepios (Aiglapios in Laconian dialect) has been identified, but nothing to Aphrodite yet. According to the younger Tsaravopoulos, a large number of valuable offerings were found at the site of a major Minoan temple to an unidentified deity, and he believes this may be the source of the legend about an Aphrodite temple. Mr. Tsaravopoulos also found a number of interesting objects in a grotto in the next bay north of ancient Skandeia, which he believes suggest the tactics used by Nicias to seize Kythera in 424 BC during the Peloponnesian War. Mr. Tsaravopoulos believes two Athenian vessels put ashore at night near the port of Skandeia, over powered the men at the watch tower and sent a signal to the rest of the Athenian fleet laying offshore. (Thucydides gives the size of the expeditionary force at 10 ships and 2,000 hoplites.) In the morning, the Lacedaemonian garrison, seeing only two Athenian ships on the beach below the city, came down from their fortress to attack the apparently weak invading force. Meanwhile, however, the full Athenian force had landed at the beach to the north (modern day Diakofti), hidden from view at shore level by a large hill. While the Lacedemonians were attacking the two ships at the foot of their city, the full Athenian force came over the hill and attacked them in the rear, presumably wiping them out. Unfortunately, Mr. Tsaravopoulo said he did not yet have sufficient evidence to publish this thesis. It is not, however, completely inconsistent with Thucydides. According to the latter, the attacking Athenians found “all the inhabitants draw up ready to meet them. Battle was joined, and for some time the people of Kythera stood firm, but finally they were routed and took refuge in the upper city. Afterwards they came to terms with Nicias….” (Thucydides, 4:54) Thucydides was clearly not present at the capture of Kythera and he may not have known how the Athenians lured a strong fighting force down from their fortifications in the upper city into the port. He appears only to have heard (or reported on) the second phase of the encounter, after the full force of Athenians arrived to find the Lacedaemons were in the port and in full fighting order, ready to meet them. Certainly, accounts agree that the battle took place in the port, rather than in the fortress. If the Spartan garrison was slaughtered in the battle and only perioikoi escaped to the fortress, this would explain further why Nicias was willing to come to terms with them as he did. It is one of the ironies of recorded history that we generally know much more about the tiny, ruling elite in any society than about the masses that actually composed it. Thus we know about the lives and loves of medieval kings, but little about the peasants that represented more than 90% of their subjects. Likewise, Lacedaemonian history is dominated by the tiny class of Spartiates, albeit a great deal has also been written about the allegedly unjustly oppressed helots. The segment of Lacedaemonian society that has received the least scholarly attention is the “middle class” – the perioikoi. 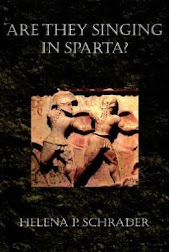 The lack of modern literature on the perioikoi is undoubtedly a result of the lack of historical and archeological information about this segment of Spartan society. The fact is, we know almost nothing about them -- not their origins, their history, the density of population, their laws or the nature of their relationship with the ruling Spartiates or their relationship to helots. The lack of archeological finds has led some historians to hypothesize that they were an essentially rural population, hardly better off than the helots themselves. Yet the very fact that they provided hoplites in at least equal numbers as the Spartans casts serious doubt on this conclusion. I would also note that the archeological finds in Sparta itself hardly reflect the might and wealth that we know Sparta enjoyed. 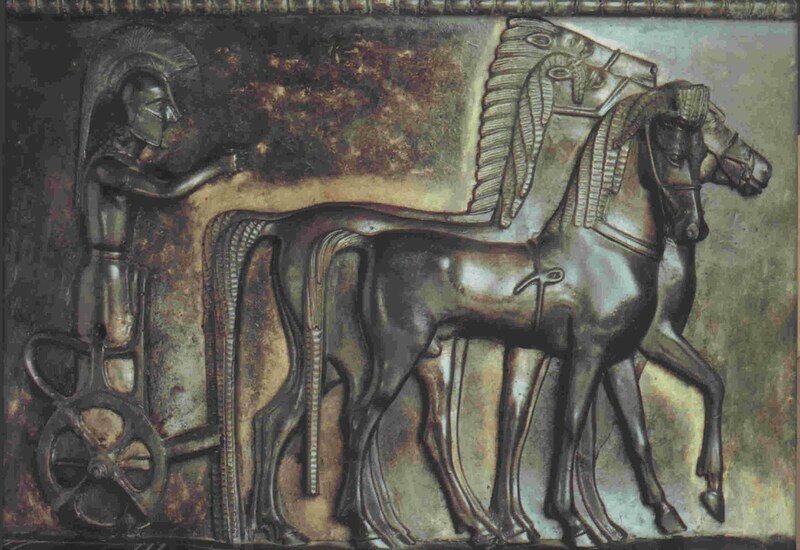 For whatever reasons, the existing archeological evidence from Lacedaemon is an incomplete, indeed inadequate, reflection of the society that inhabited the region in the 7th to 3rd Centuries BC. Yet, while we know almost nothing about the perioikoi, we can infer a great deal. We know, for example, that in the later years of the Peloponnesian war, perioikoi hoplites were fully integrated with Spartan units – and that implies comparable levels of training, equipment and above all trust. While the enemies of Sparta (and modern commentators) make much of the hostility of the helots to Spartiate rule, the loyalty of the perioikoi is rarely questioned – or mentioned, despite its significance. We know Sparta had a fleet but that Spartiates had virtually no opportunity to gain the extremely complex knowledge necessary to build and sail ancient vessels. We know that Spartiates were prohibited from pursuing any profession other than that of arms (and civic administration – see my last entry), but Lacedaemon had extensive international trade. We know further that Lacedaemon produced and exported timber, pottery, and bronze works. It had mines and quarries, and, of course, every kind of craft necessary to daily life in the ancient world from carpentry and metal working to tanning and basket-weaving. Who provided the manpower and the know-how for all these various industries, if the Spartiates were prohibited and the helots were working the land? The logical answer is the perioikoi. 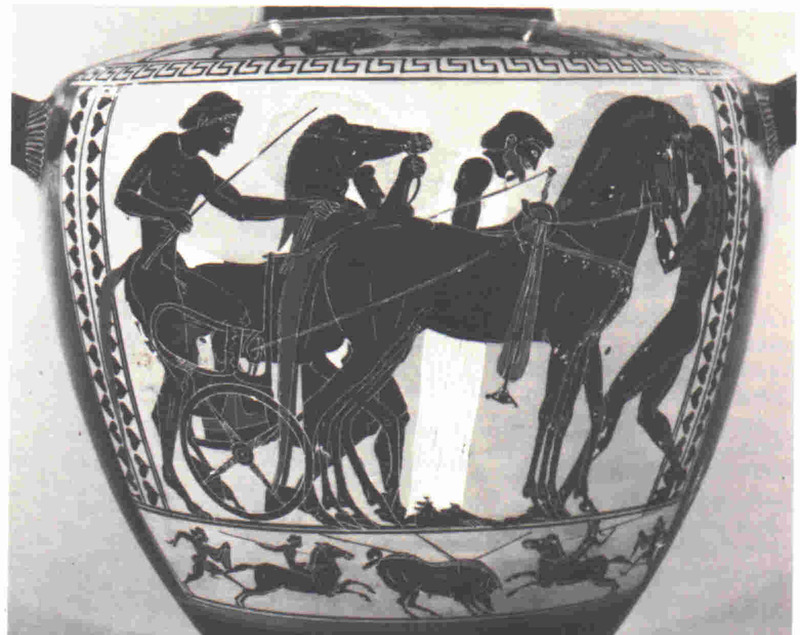 Furthermore, by ascribing to the perioikoi these various urban professions generally held by citizens in other Greek cities, we quickly see a way in which the perioikoi could have been both integrated and co-opted into Spartan society despite their undeniable second-class political status. The Perioikoi had no voice in Spartan policy and yet were expected to risk their lives side-by-side with the Spartiates. It hardly seems credible that they would have accepted this situation for long – particularly in the bad years of the Peloponnesian War – if they had not enjoyed other benefits. The financial benefits of a monopoly on industry and trade throughout the rich territory of Lacedaemon could be such an incentive. The very restrictive nature of Spartan citizenship, which confined Spartiates to the army and civic duties, opened immense opportunities for the perioikoi to enrich themselves. Even if completely excluded from land-holding (which to my knowledge they were not, but which might have been the case when the Spartiate population was expanding in the archaic era), there would still have been ample opportunities to not only earn a living but make a fortune as well. The experience of other societies shows that a manufacturing and trading middle-class can indeed prosper even when politically disenfranchised (see, for example, Medieval France). This, I believe, is the key to perioikoi loyalty and the essential character of the Spartiate-Perioikoi contract. While Spartiates reserved political power to themselves and evolved a culture that disdained the public display of wealth; the perioikoi traded political enfranchisement for the dual benefits of economic freedom and security. Behind the shields of Sparta’s incomparable army, the perioikoi were free to enrich themselves for generations. Only after Sparta fell into decline and her citizen ranks grew too thin to guarantee the protection of Lacedaemon did the Spartiate-Perioikoi contract begin to unravel. The decline of Spartiate population forced an increasing dependence on perioikoi troops, which put perioikoi at ever greater risk. As long as Sparta was winning wars, that might have been acceptable, but once Sparta was defeated at Leuktra a perpetual disenfranchisement of the periokoi became untenable. Throughout the archaic period, however, the division of labor between Spartiate and perioikoi appears to have worked admirably. My next entry will be posted April 25 as I will be travelling in Greece until then. Happy Easter! Leonidas is arguably the most famous of all Spartans. Numerous works of art depict him. He was the hero of two Hollywood films. There is even a line of chocolate confectionery named after him. But no serious biography has ever been written, and what is most often portrayed is his death. Leonidas is remembered for commanding the Greek forces that defended the pass at Thermopylae against an invading Persian army. He is revered for refusing to surrender despite betrayal that made defeat absolutely certain. Thus Leonidas came to symbolize the noblest form of military courage and self-sacrifice. The events leading up to the three-day battle and death of Leonidas with three hundred other Spartans and seven hundred Thespians at Thermopylae have been the focus of historians, writers, and artists from Herodotus onward. But Leonidas was not a young man at the historic battle where he gave his life. He had lived close to half a century (if not more) and reigned for ten years before he took command of the Greek alliance defying Persia. It was those years preceding the final confrontation with Persia that made him the man he would be at Thermopylae. To the extent that we admire his defiant stand, learning more about his early life and tracing the development of his character is important. Yet so very little is actually known about his early life that historians have been discouraged from attempting a biography. Novelists, fortunately, enjoy more freedom, and what we do know about Leonidas’ early life is enticing. This is why I chose to devote a three-part biographical novel to Leonidas of Sparta. 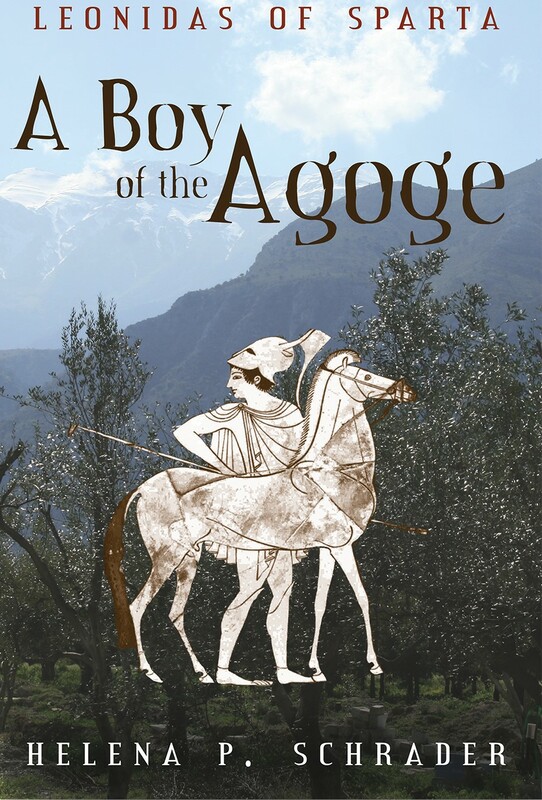 The first book, A Boy of the Agoge , was published last year. In it I built upon known facts about Leonidas’ birth and family situation and Sparta’s unique educational system to construct a plausible picture of Leonidas’ boyhood. 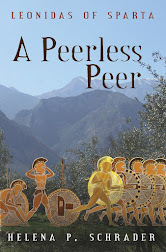 This week I delivered to my publisher the second book in the trilogy, A Peerless Peer. 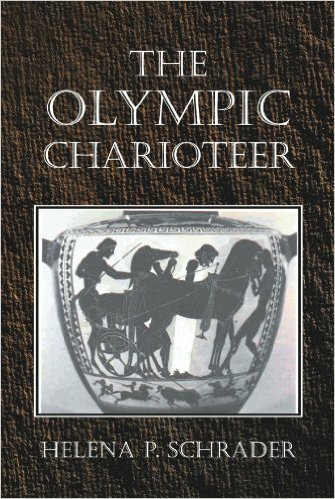 In this second book, I focus on the next stage of Leonidas’ life, the years when he was a common citizen before he became a king. This is the period in which he married his niece Gorgo and gained experience in battle and politics. 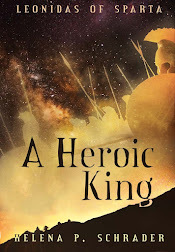 Building on the few known facts, listening to the sayings attributed to Leonidas and Gorgo, and knowing how Leonidas met his destiny at Thermopylae, I have written this novel. While based on all known facts about Leonidas, Gorgo and the society in which they lived, the novel goes beyond the bare bones of the historical record. It interpolates from these facts a reasonable hypothesis of what Leonidas and Gorgo might have been like and what they might have done, thought, and felt. The characters that emerge are greater than the historical input. 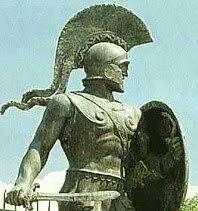 Leonidas is consciously portrayed as the quintessential archaic Spartan, because that is what he has become in legend. Gorgo, likewise, epitomizes that which set Spartan women apart from their contemporaries—without robbing her of individual traits and personality. The two principals are surrounded by a large cast of secondary, largely fictional characters, each of which is unique and complex. In short, this novel is quite candidly fiction. As the publication date approaches, I will post more information about release dates, price etc., and eventually provide a link to amazon.com for those of you (hopefully many of you!) interested in purchasing this novel.